Oldenhammer in Toronto: Star Wars: Hired Guns, Wookie Warriors and Stormtroopers, oh my! 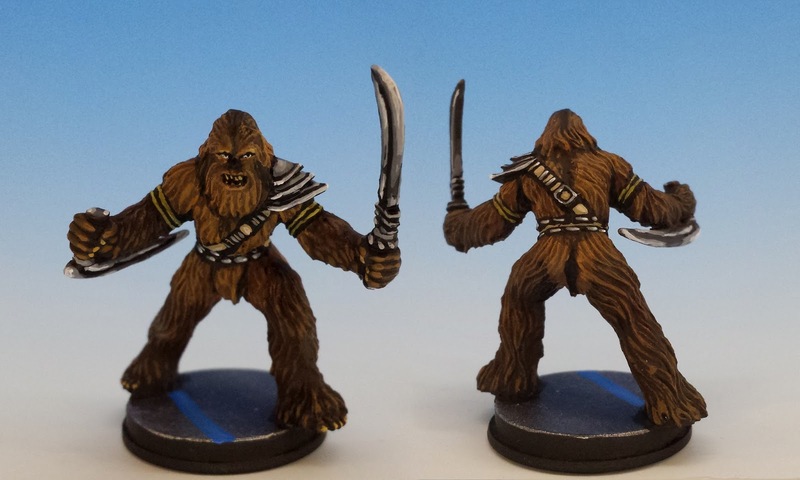 Star Wars: Hired Guns, Wookie Warriors and Stormtroopers, oh my! Consider the Rodian. An alien in the classic form: green skin, pointed ears, antenna like sausage rolls. Maybe they are slow on the draw. Maybe they are not. In any case, I am glad that they are here. 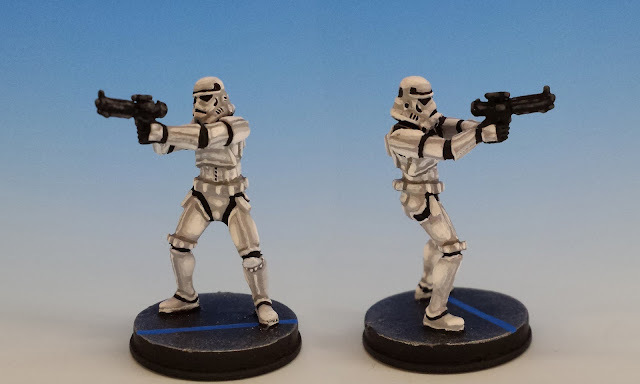 Fantasy Flight Games continues to produce miniatures for Star Wars: Imperial Assault at a stately pace, and I paint them as fast as I can get my hands on them. The latest is a an odd assortment. But my favourite are the Rodian "Hired Guns". Mrs. Oldenhammer-in-Toronto often accuses me of favouring "dreary" colours when I paint. And so, for these space thugs, I decided to use the pinkiest pink I could contrive. 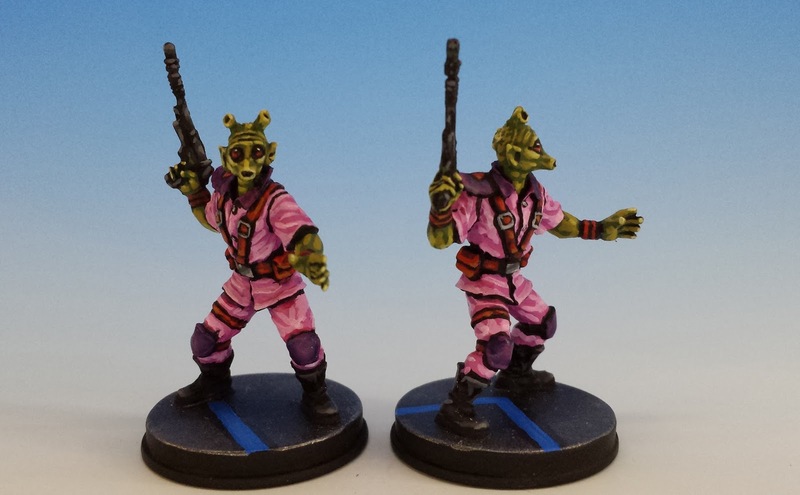 Who knows, perhaps to a Rodian bubble-gum pink with red accents is an attractive combination. My favourite part of these miniatures is the rules that go along with them. 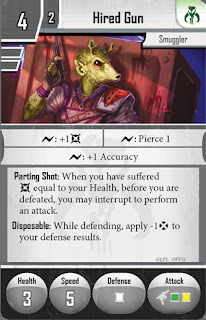 The FFG does a top-notch job of capturing the flavour of Star Wars, and this is a homage to Greedo, the hapless bounty hunter. The Hired Guns are expendable by design -- they're at their best when used as cannon-fodder, because before they die, they have can take a parting shot at the hero who zapped them first. Watch out, Han. 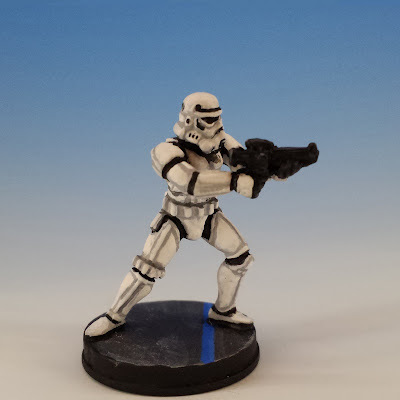 Also in this new release is an alternate Stormtrooper model. It's not the most radical redesign, but it's an improvement on the earlier model, which always looked to me like the trooper had a gamy leg. 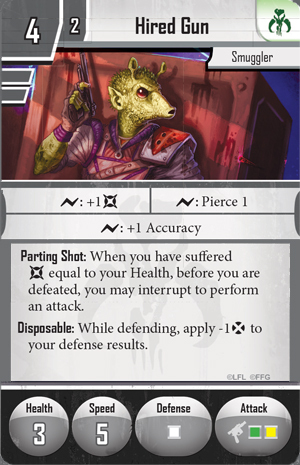 In any case, I'm just glad to see FFG expand the Stare Wars range with variant models since it adds vibrancy to the game. I hope they keep it up. And finally, there are the Wookie Warriors. These ones give me concern. The models are uninspired, with clunky weapons and an uninteresting, symmetrical pose. There's something about their expression that suggests that they're about to tackle a spaghetti eating contest rather than a squadron of Stormtroopers. But the sculpting is not the worst part. I won't belabour the rules-talk those who don't play Imperial Assault as a skirmish game, but suffice it to say that these hairy killers have instantly become best value on the table: durable as a Soviet tank and fierce as a grizzly bear. Single-handedly, they make the Rebels the most powerful faction in the game. I have trouble imagining why in tournament play, a competitor wouldn't simply field a force with as many of these Wookies as possible. They'd tear Darth Vader to ribbons. Does he look angry? Or merely a little hungry? The new Stormtrooper is cooler, right, and I have to agree about the Wookie, haha, but anyway you got him totally right, I like what you did here! I really like that sculpt too. He looks surprised and almost naive. "You're not going to shoot me - are you?" That pink/purple/red combo works very well. Contrasts nicely with the green skin too. Your commitment to excellence is amazing, your work on IA is going to force me into buying the set and add ins at some point, perhaps a Christmas present to myself. I think pink combo is the best. It is really good look for radian. I would like to prefer it. It's great consideration.